It seems that the Tour de France is coming our way again next year. No doubt we’ll make the same effort to avoid it as we did this year. But if you do fancy getting a taste of the countryside through which the members of the peloton will be flogging themselves stupid, there’s a gentler, more enjoyable way of doing it. As Grant Petersen of Rivendell fame is wont to point out, ‘Le Tour’ is not, in fact, a tour but a race, or the Big Old Race Around France (BORAF) as he memorably dubbed it. (Personally, I’d substitute ‘Big’ with ‘Boring’, but there you go). 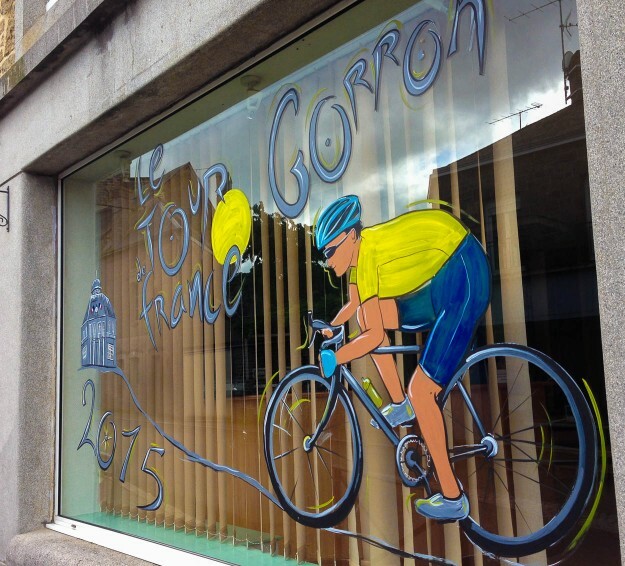 This year, Le Tour came through the town of Gorron, which is eight minutes down the road from us. That was on the leg from Livarot – best know for its exceedingly smelly but wonderful cheese – to the beautifully mediaeval town of Fougères. I’m not sure the riders had time to appreciate these local features. Probably too busy taking drugs and dreaming about the money. Racing really does spoil everything. The first we knew about the BORAF coming through our neighbourhood was when bike decorations starting going up everywhere. We didn’t go to watch. I have a strict limit on the number of psychopathically competitive sweaty men in lycra I need to see in one day. Besides, I don’t see the attraction of just watching a bunch of cyclists whizz by. They’ll be doing it again next year, though. In 2016, Le Tour will start at Mont St-Michel and then head up the Cotentin Peninsula to the D-Day beaches. This is a beautiful area of Normandy. And while the racers will be zig-zagging up the Cotentin with their heads down and their legs burning, there is a much more pleasant and enjoyable way to do this route, as the Experience France by Bike blog points out (check out that blog for a ride report, routes & advice – it’s a great site). There is a major cycle route joining the D-Day beaches to Mont St-Michel, so you can roughly follow the route taken by Le Tour while enjoying the scenery from the easy-going voie verte. Now that’s real cycling! Strava turns every bike ride into a race. The worst thing is that it is mainly a race against yourself as you can’t hope to compete with those that are younger, lighter and fitter.